Global Nephro Training Center © 2019. All Rights Reserved. 1. Is the training course accredited by Professional Regulation Commission? Yes. Global Nephro Training Center is recently granted with 40 CPE Units by the Professional Regulation Commission due to its training program competencies and duration. 2. What are the requirements for the training? 3. How long will the training last? The duration of the training usually lasts for four (4) months inclusive of the one-week rest period. 4. Why is there a one-week rest period? The one week is allotted for trainees to fulfill their financial responsibility and report to the GNTC office to get their sticker corresponding to the module they would be attending. It is also a rest period for trainees to replenish their energy for the incoming module. 5. Can I skip modules? A trainee is not allowed to skip modules. To satisfy the requirements of the certificate, they need to complete 120 hours of didactic and 600 hours of clinical duty. 6. Can I delay taking the next module? Yes, you can. Provided that the whole training must be completed within one year. After a year, those who wish to pursue the program will be interviewed first and negotiations of the modules to be refreshed will be decided by both the training administrator and head nurse. 7. What are the potential opportunities that I can get after training with GNTC? Work in the United States of America as Patient Care Technician through our BONENT PROGRAM. 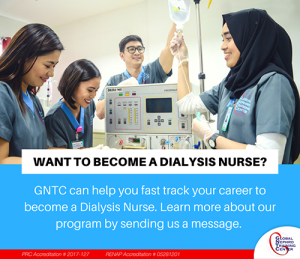 Do you want to avail of our FREE Orientation to know more about our Dialysis Training Course?